Once I got all those “scraps” put away, I felt free to sew again! More about scraps in a bit. I’ve been working on a pattern by Pat Sloan called Grandma’s Kitchen. This project was a “weekly” block beginning last June and concluding in December. I’ve been posting periodic updates as my blocks were made. I am primarily using 30’s reproduction fabrics, but have used some more modern fabrics for the neutrals. I am now starting to build those blocks up into “rows”. The pattern has lots of “filler” pieces that were not part of the original block construction. About October the layout was released and when I saw those “filler” pieces, I decided to wait until all 25 blocks were made and I could make better choices of fabrics. Once I got all those “scraps” put away, I felt free to sew again! I also have finally beaten the bronchitis that has laid me low for 3 weeks, so hanging out for hours in the sewing room has been a joy! I worked on Row A on Friday. The yellow strips are those “filler strips”. I am using the yellow where ever the pattern called for a dark strip. The white strips around the 2nd block (the candy dish as Pat called it) are a coordinating print. I chose it for where ever the pattern called for a light strip. I used this white in several blocks during . The friendship stars (4th block from the left) were “filler blocks”. I used a bit of that red in another block near the end of the process, so I thought it would be nice to bring it near the top of the quilt. Balancing all these fabrics is kind of fun. I want the colors not to appear to heavy in one area. The next photo will show Rows A – C made. I worked on Rows B & C late Saturday. 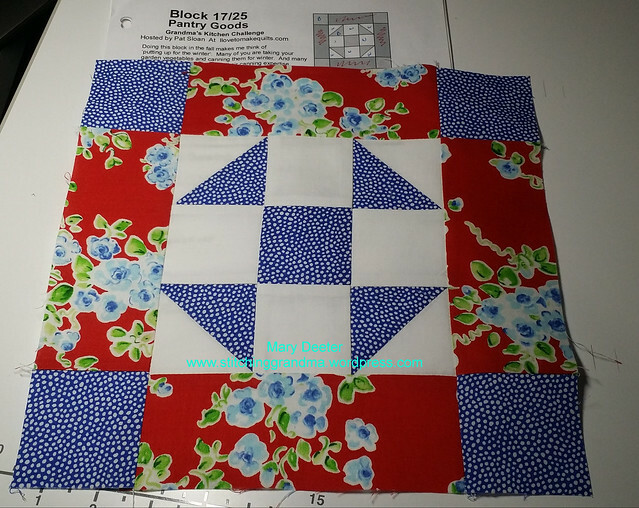 Row B has more “friendship stars” in the first block, and I was glad the red was spaced out a bit, and glad I did not use the same fabrics for the filler blocks. 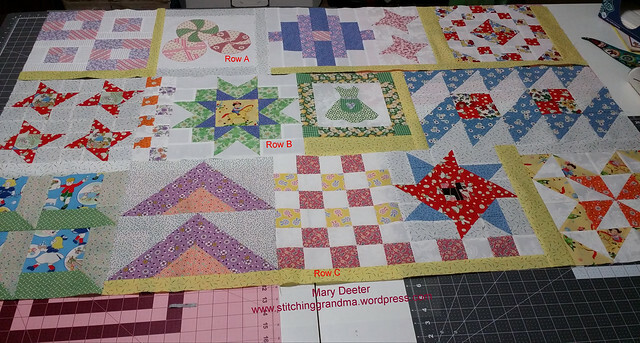 Row B has filler blocks (orange and purple checkerboard made with 2″ squares) and strips of white and yellow, and a “repeat” of the last block in the row that I had to create. Row C had a much larger “checkerboard” that was a full block. 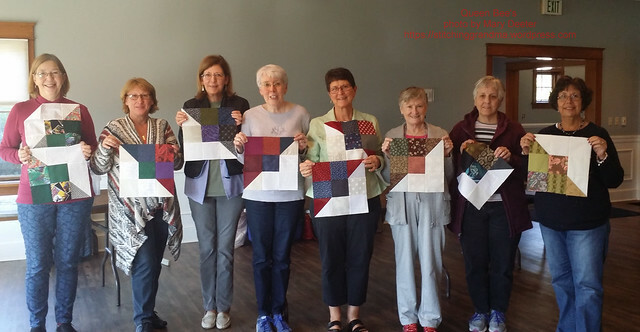 These were made with 2.5″ squares. Following the pattern, it was interesting to work this one, because the bottom row was to be all the “dark” (red)checkers, and it continued on, under the next block as a filler. I went with it, and find it is interesting. I was surprised, because I would have thought making them the light (yellow) checkers would be more logical. Who am I to argue with the designer! I’m having fun putting this part of the project together. There are a lot of decisions yet to be made on fabrics as I approach the remaining stack of blocks. I know which “colors” I want to use for the upcoming filler blocks, but not which fabric yet. I’ll get there & give you another look as I make further progress. While I am making these filler blocks, there are scraps being generated! I’m keeping everything together so far, as I don’t know which bits & pieces I may work into the project. Scrap Storage System – more info! 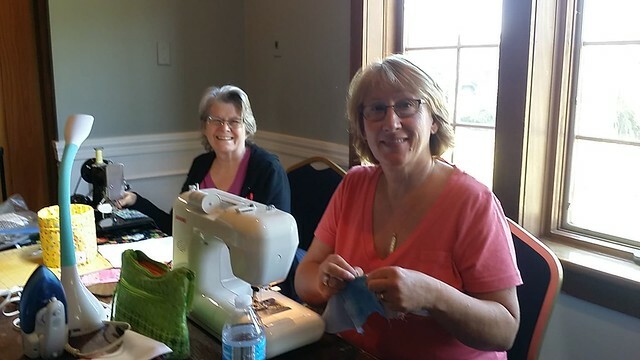 Speaking of scraps…here are some pictures from my last round! 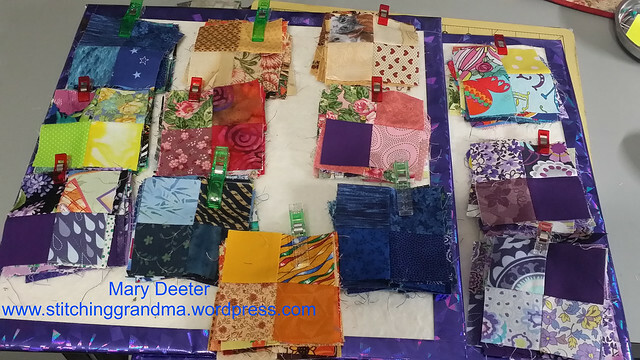 It never ceases to amaze me how much “good stuff” is left at the end of a quilting project! This is the “last” of the pieces out of my yellow stacker. They are cut and ready to put away! I am using “shoeboxes” for strings. Generally I consider a string anything that is 2″ or smaller. These tend to be pieces that are not “width of fabric” and are the first thing I grab when I feel like making string blocks. Mostly they are sorted by color family. The reds and oranges and yellows are together, the blues and purples are together and the neutrals are together. The boxes aren’t labeled yet, but are easy to figure out. I like them in color families because I like my string blocks more “orderly”. I do have a container of 1.5″ strips in the previous photo and that box gets full rather fast, and when it does, the remainder end up in the string box. String pieces may not be as carefully trimmed to size, as I don’t care if the piece is 1 3/4″ or 1 5/8″…the precision is not necessary. In my previous post, Scrap Decisions , I included a chart with the range of sizes that I cut and store. Someone commented about the “bricks”…those are the rectangles. I don’t cut a lot of them, but I do use them from time to time, and find them handy to have on hand. The link to Bonnie’s system is very lengthy, so get a cup of coffee, and read (after you finished reading my post of course)! And bookmark her blog, and LOOK AROUND at the wealth of free information she willingly shares with her readers! 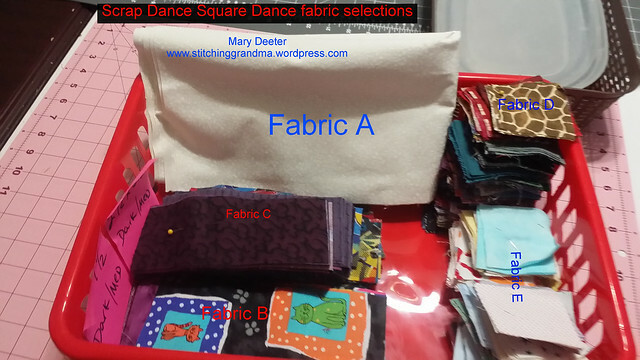 She has a tab for FREE PATTERNS and at the top of that page is a handy chart which sorts her patterns by “strip size and block and brick size”. This might help you chose what to store! And it might help you decide “how” you want to store your scraps. 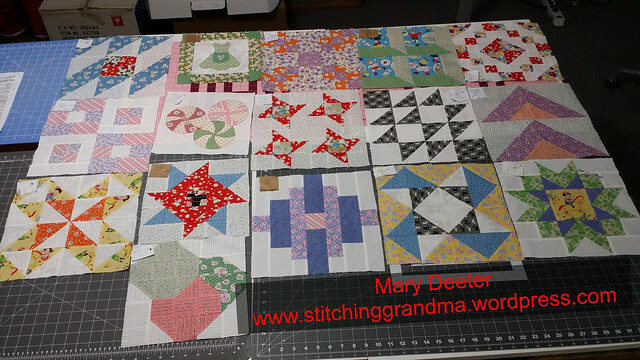 I also follow other quilters, like Pat Sloan who offers lots of sew-alongs that include free patterns. (Fore example Grandma’s Kitchen!) On her website http://www.patsloan.com/ you have to “work a little harder” to find her free patterns. She has a ton of stuff, so spend some time there as well. Lastly, I mentioned in other posts, that I used information from Joan Ford as I developed my “Scrap Storage System“. Joan’s website https://hummingbird-highway.com/ will give you links to books she has written on the topic, and why she saves what she saves as well as freebies and fun stuff. What ever system you follow or develop for yourself, make sure it is one that will work for you and that you will find yourself USING your scraps! 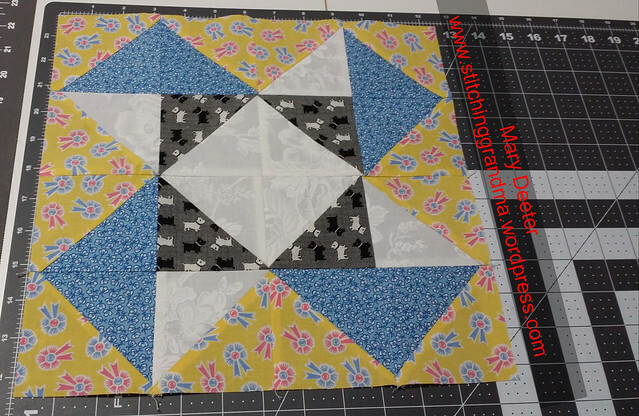 I also have fun posting my scrap projects periodically and sharing the post with OH SCRAP! Do you save your scraps? How do you do it? 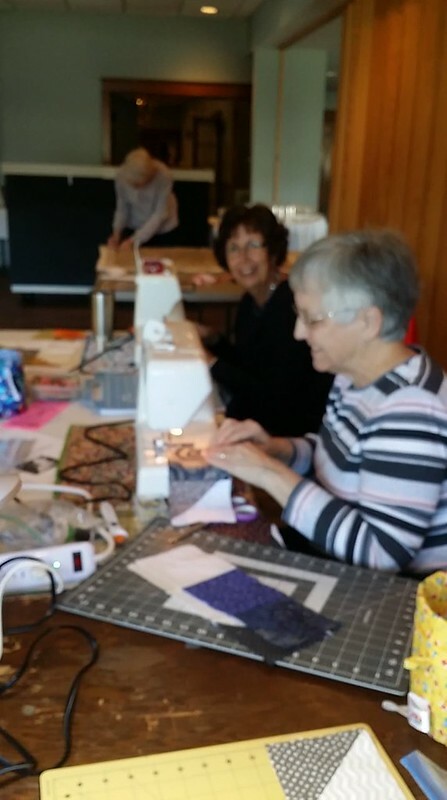 Do you follow other scrap quilters? Who ?? 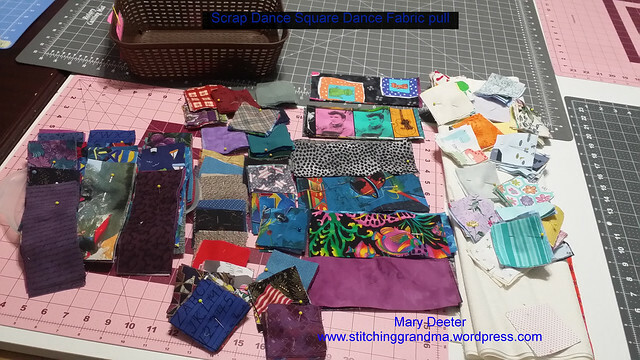 As I was taming the scraps, I was setting aside pieces cut to size for the Square Dance Mystery. Step One is to cut those fabrics. Today, I gathered up those pieces and counted out what was required and determined I had plenty set out for a Twin Sized project. All is ready except my fabric A which needs to be cut. Everything came directly from the scraps in the “yellow stacker” that I have mentioned in the last few blog posts except Fabric A. I (gasp) took it out of my neutral box that was set aside for my Bonnie Hunter project that is a UFO. It was “just the right size”. I went with it because Carole had suggested a tone on tone would be favorable for this constant Fabric A. So, many thanks to the friends who have gifted me their scraps in the last year! I look forward to including them all in this Square Dance mystery! When you are out “shopping” for fabrics, I strongly encourage you to pick up a few yards of those great neutrals that work for background fabrics and stash them away. A few days ago a friend of mine came in search of “low volume” neutrals for background fabrics. Sometimes they are not easy to find, and we went “digging” in the scrap bins for her bits and pieces. I am heading “back” to the sewing room to cut “Fabric A” and put all those lovely scraps that I have cut and sorted for this project into a nice basket to await Step 2 in February! And, perhaps, between now and then I will get back to one of those other projects that has been hanging around for a while! PS – One of my readers asked “what sizes” do I cut and save – Here is “MY” list – which, as I have mentioned is a combination of Bonnie Hunter and Joan Ford. I have this list on the wall by my cutting table, and it is a good reminder. 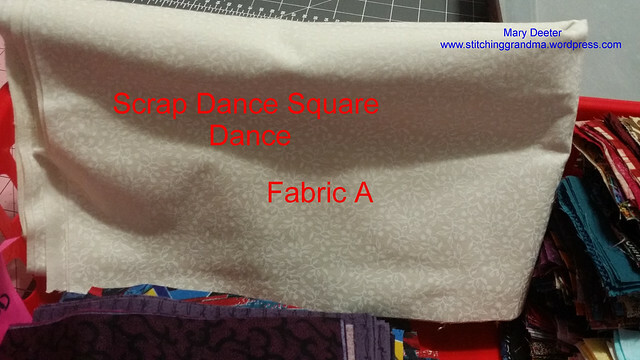 It helps me to look at the fabric and get the best use from a raggedy mess! Remember – press and CUT THE SCRAPS! My last “sewing” for 2017 has been done! 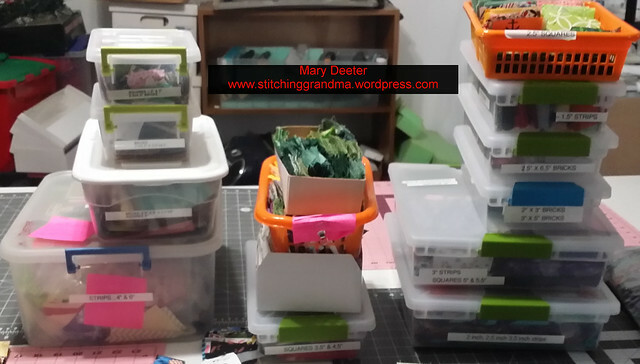 I spent a few hours “cleaning up” and “putting away” a lot of mess in my sewing room. I cleaned off my cutting table and put a lot of stuff away. I cleared off my “work table” and made room for a project. 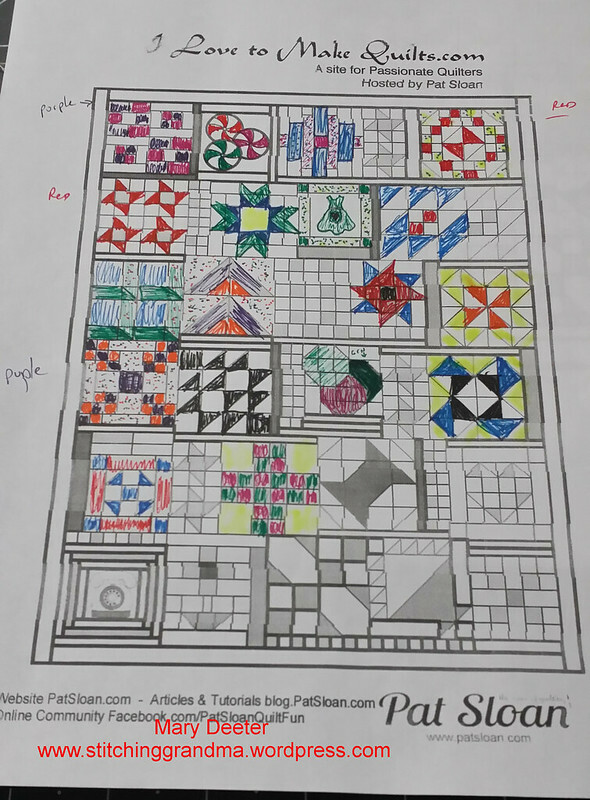 Once that was done, I pulled out my pattern book and box of fabric and basket of blocks for Grandma’s Kitchen – by Pat Sloan. I stopped working on these in mid October before I left on a trip for a month. These are the first 16 blocks(not in pattern order). I needed to pick up at block 17 and hopefully finish up at block 25; plus make all the setting blocks. (That is going to take a week or two). 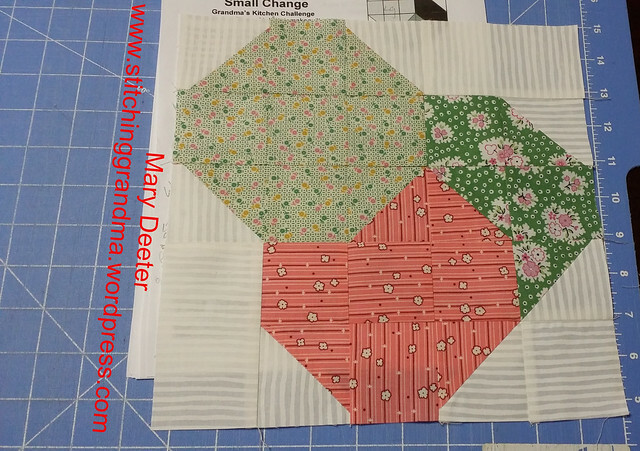 Once the planning for the next 2 blocks was done, I got busy and made block 16, and pulled the fabrics for block 17. I think it did help to do a bit of coloring, because I could better understand as I colored in the blocks, where there needed to be more of a particular color. I know I need to get a little more pink and purple and orange into the quilt. I am trying to decide how to do those filler blocks and make sense of them too. I made a decision on the fabric for the “spool block” too. I want to use one of the stripe fabrics I have for the middle of the spool. (While I was sorting piles of fabric, my husband was watching, and figured out what I was up to and provided a bit of his color sense to what I was doing. I find his opinion most helpful). Meanwhile, my design wall has been full for the last 6 months and I need to get going to get the borders on my Talkin’ Turkey! That is all it needs. (The blocks and rows and columns are all sewn together, and the borders are made, ready to attach!) I need to free up my design wall!! Following all that contemplation and coloring, I did finally do a little sewing – the last for 2017. I present block 16 for now…..more to follow in 2018! SCRAP HAPPINESS- Strings and 4 patches! I’ve managed to assemble a twin sized quilt using the string blocks I made in August. There is no “official pattern”, I just worked out the sizes as I went along. I was inspired by several different string quilts I saw on Becky Petersen’s blog, Quilted Twins. 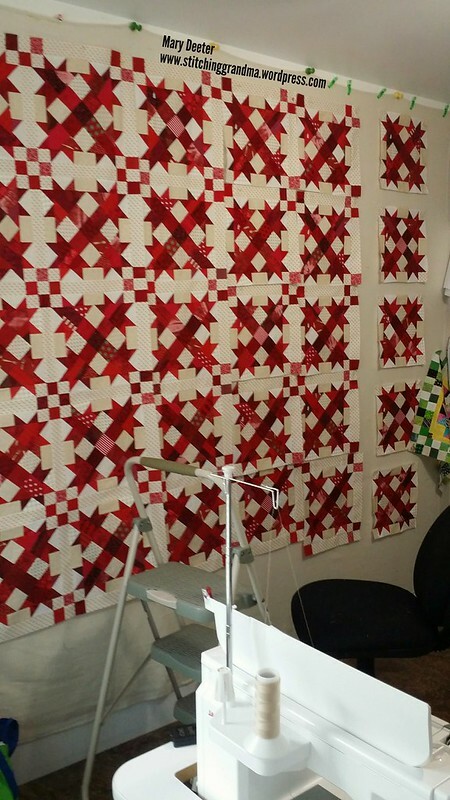 Becky finished up a string quilt recently and set the string blocks with alternate blocks and surrounded everything with white. I decided I liked the way the white played with the bright fabrics, so that is how I came to sash these blocks, using scrappy white fabric. 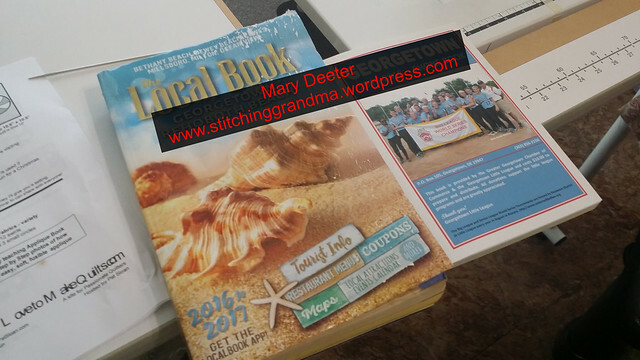 The blocks were stitched on 6×6″ phone book papers, and set with 2″ white sashing and 2″ cornerstones. I tried to use a wide variety of white fabric with print for the cornerstones. 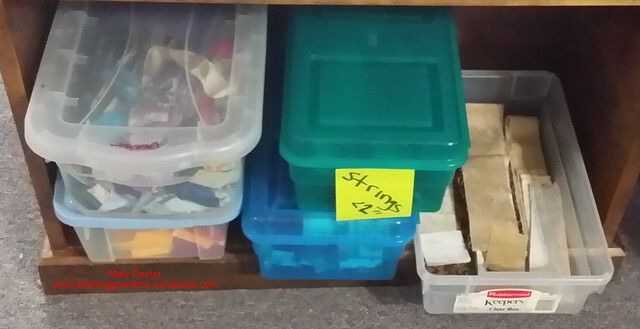 The “strings” came from my scrap user storage system, as did the 2″ cornerstones. 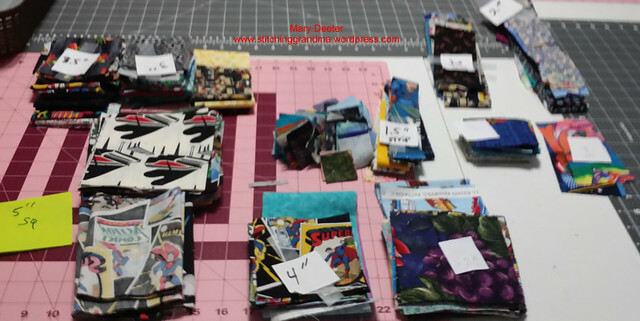 I was able to get many of the 6″ sashing strips from scrap fabric, but needed so much I resorted to cutting a nice 2″ strip off of many pieces of yardage I have set aside for my “next” Bonnie Hunter project. I’ve done all of the sewing on this project on 2 machines, both my Brother 6000i and my 1949 Featherweight. Last week I had to take a break and let the hubby do a little servicing of the Brother. Seems the “timing was out of whack”, with the needle striking the bobbin case, and he was able to make the necessary adjustments. (Thank goodness for Google and You Tube). He is pretty handy to have around. He does a lot of “micro work” with electronics for his model railroad hobby and has an excellent mechanical and troubleshooting mind. The next photo is one of hubby’s little projects. And I mean little. 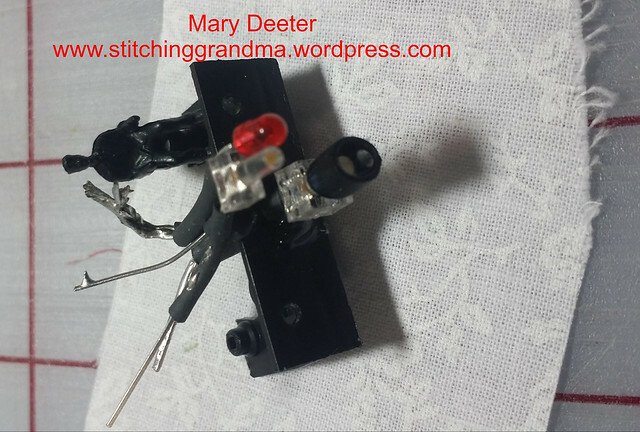 He is wiring LED lights into an assembly for an HO locomotive. Note the scale of the project. 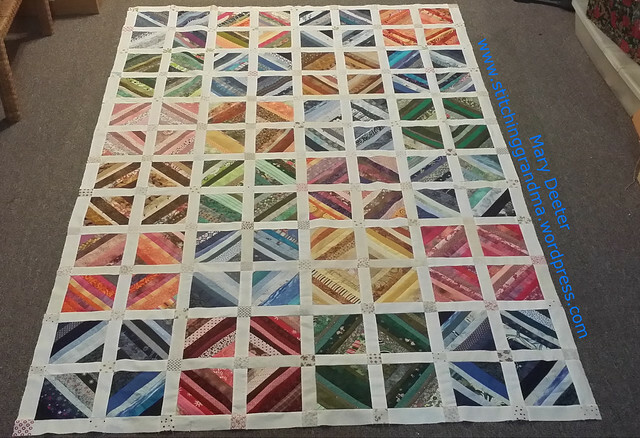 I enjoyed this string quilt project, and think it needs a bit more in the order of a border, so I will be doing some more of those fun string borders that I did on my Scrap Dance Two step. I figure, why not use up the strings when the phone book paper is plentiful? I love sewing the strings. The sashing was a bunch of work! 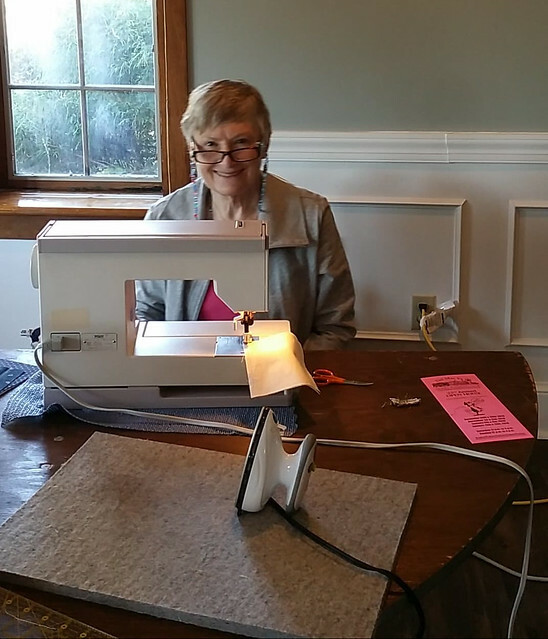 In the last 2 days I have had 2 more phone books arrive in the driveway and I did a little quilter cheer that I hope would make Bonnie Hunter laugh! I will be linking this to Oh Scrap! And linking up at the end of the month to the OMG – One Monthly Goal . If you haven’t seen those blogs, hop over and take a look. If you found me from one of those blogs, please let me know! 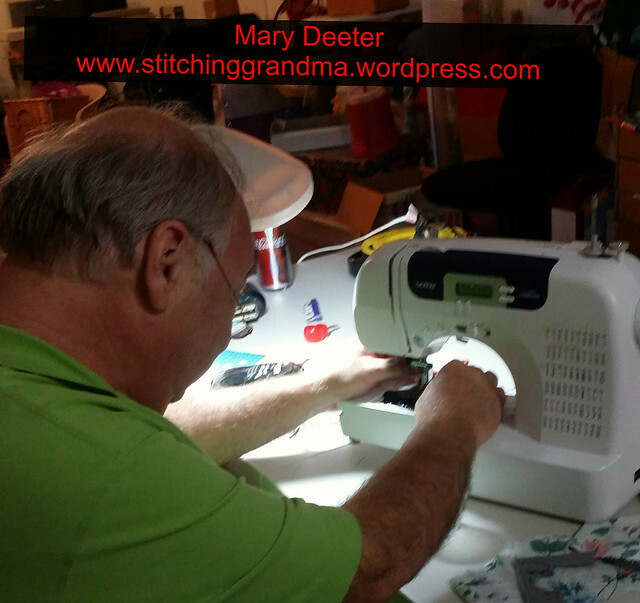 What’s happening in your sewing room?